Rick Sternbach has been a space and science fiction artist since the early 1970s, often combining both interests in a project. His clients include NASA, Sky and Telescope, Data Products, Random House, Smithsonian, Analog, Astronomy, The Planetary Society, and Time-Life Books. He is a founding member and Fellow of the International Association of Astronomical Artists (IAAA), which was formed in 1981. He has written and illustrated articles on orbital transfer vehicles and interstellar flight for Science Digest. 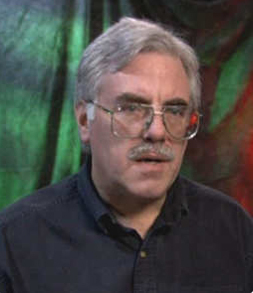 Beginning in the late 1970s Rick added film and television illustration and special effects to his background, with productions such as Star Trek: The Motion Picture, The Last Starfighter, Future Flight, and Cosmos, for which he and other members of the art team received an Emmy award, the first for visual effects. Rick also twice received the coveted Hugo award for best professional science fiction artist, in 1977 and 1978. Rick Sternbach’s contribution to Starship Century: Tricentennial Illustration.